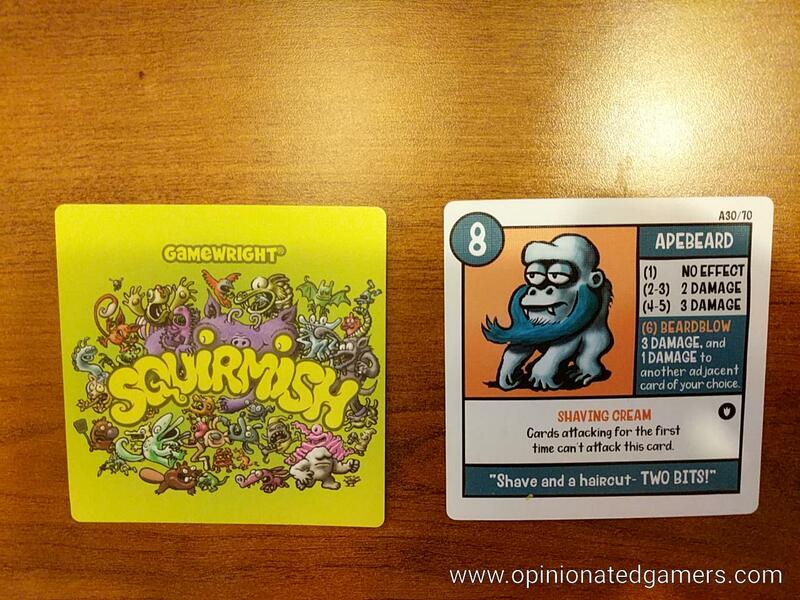 Squirmish is a game which was originally self published (and self illustrated) by Steven Stwalley. It has since been picked up by Gamewright for mass distribution. 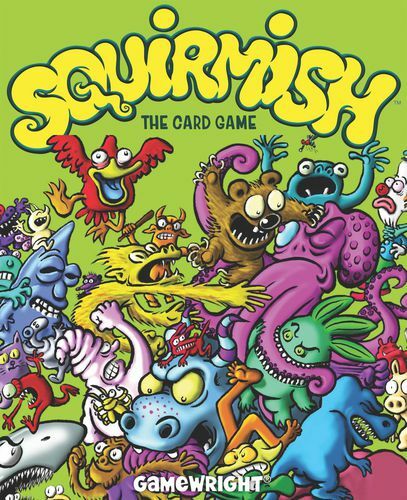 This small format card game has players fighting against each other in a pile-on called “The Squirmish”. 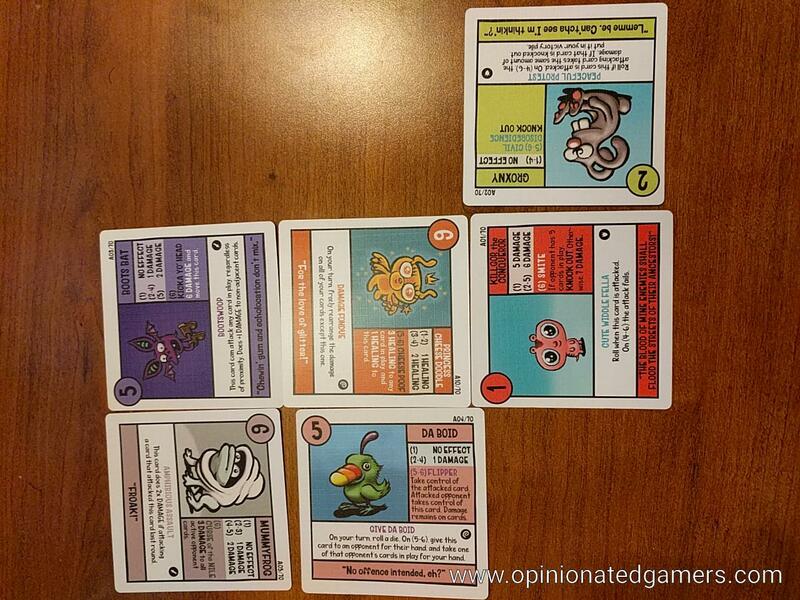 you MAY place a card in the Squirmish – this is the collection of cards face up on the table. Every card can have up to 4 cards orthogonally adjacent to it. You always place cards so that they face you (so that you can read them) – this is how ownership is denoted. When you place cards, you can either put one in an empty space adjacent to any other card in the Squirmish OR you can replace one of your existing cards with one from your hand, AS LONG AS the first card does not have any damage counters on it. Each card has a “battle cry” at the bottom of it, and the rules state that if you read this aloud, you will get a bonus on your attack that turn. Also, you should remember that you can only have 5 cards in the Squirmish at any time, so once you reach that number, you cannot draw more and you are forced to play something from your hand. 3] Move or Attack – you MUST move or attack. To move, you simply switch positions with any adjacent card in the Squirmish. If you attack, you choose which adjacent card is your target. Then players read the effects of their attack from the card and roll the die to see what happens. 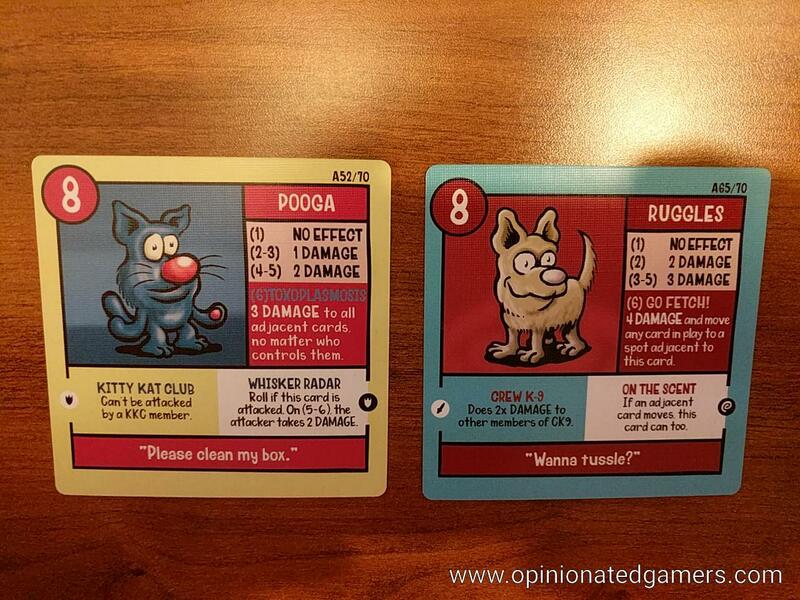 Damage counters are added to the attacked card based on the effects. If the attack does enough damage to overcome the HP total of the card, the card is defeated and the attacker takes this card into this victory pile. Remember, that you need to get three cards to win. If the removal of a card causes the Squirmish to break in two, players take turns in player order to reattach these orphaned cards to any valid edge site. 4] Resolve Abilities – Each card has some special abilities. Some of these abilities will take effect when attacking or defending. Other cards have abilities that come into play now. If your cards have such abilities, read them out loud and resolve them now. Then say that your turn is over so that the next player can go. The game ends immediately when someone has collected 3 cards. Squirmish is a fun, family-friendly game which surprised me a bit with the depth of play. When I read the rules, I thought that it would be too kiddy-like. While the artistic style and the humorous text on the cards makes it appropriate for kids, the actions on the cards does give the gamer something to work with! 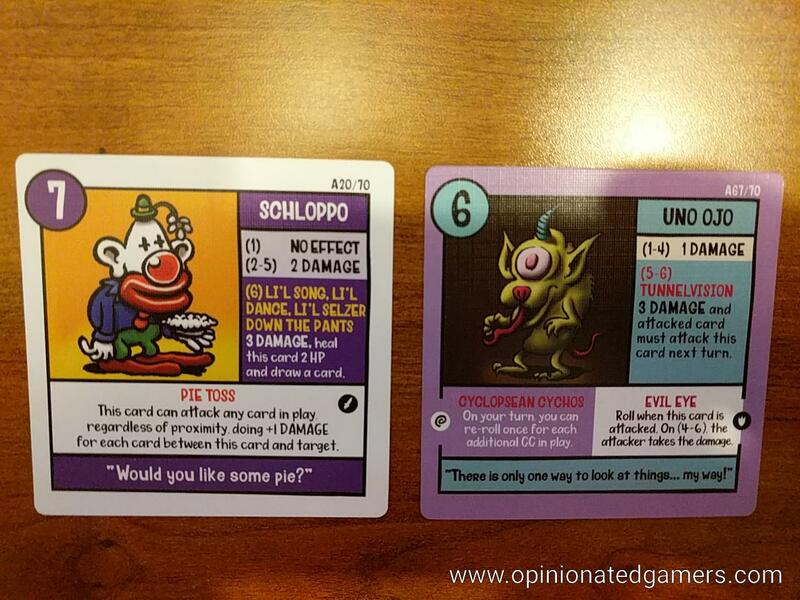 There are a bunch of different monster cards in the game, and each of them has different abilities – this allows the player to discover all sorts of interesting combination plays as the cards work with each other. As the Squirmish grows, you could have as many as 5 cards in play at a time, and it can be a bit of work keeping track of all your card abilities. For most gamers, it should not be an issue, but this is the one thing where younger gamers might need some help to make sure that they know what all their options are. In our plays, some of the cards seem stronger than others – but none are so powerful as to make the game unbalanced. If nothing else, if my opponent has a card out there with a strong ability, I’m more likely to try to attack it to take that ability away. The artwork, as mentioned, is whimsical – and it should be noted that it is also done by the game designer. The cards are easy to read when help up close, but if you play on a big table, it can be hard to read the small text from distance. The game has worked really well in a 2 player game as there is a nice flow of attacking and defending. In the one multiplayer game that I have played, there was a bit of holding back because people didn’t want to attack cards and leave them in a state where the next person could swoop in and get an easy victory card. But, in the end, you have to move or attack each turn, so the game eventually forces you into action… Our 2 player games played quickly, and the 4p game went about 35 minutes – which was maybe just slightly longer than I’d want this sort of game to last. If you’re looking for a game to introduce the concepts of individual card actions and combat, this would be a good choice. It also will be a good filler for gamers looking for a few laughs mixed in with their gaming.